We are excited share that we have finalised the first design phase of a new digital service, Mimba. Mimba is a global platform to advance women’s health and rights. The service will connect people with a need to people with the means and willingness to contribute to women’s health and rights in a tangible manner. Envisioned as the new underground, Mimba is fast, curious and on a constant quest for a better world. 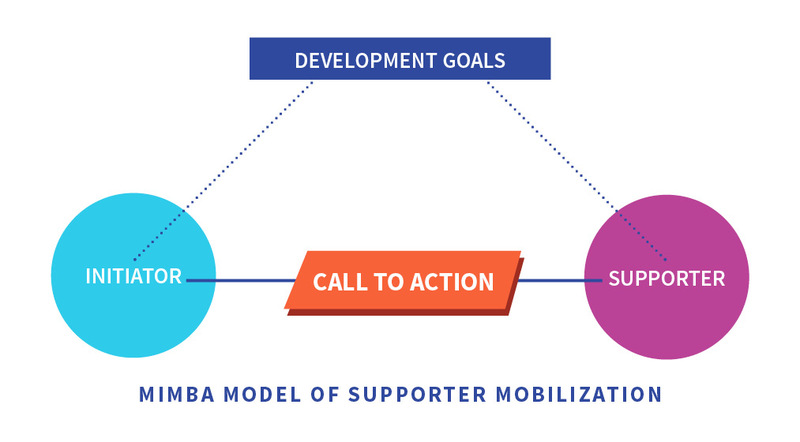 Pictured below: The Mimba Model. Supporters – they are people like you and me! Mimba offers a platform to connect and collaborate with subject matter experts in advancing women’s rights and health globally. Besides time, we all have something to give to help others; We have skills, we know people, we possess local insights as well as countless other talents yet to be discovered. But most importantly, we have big hearts. Everyone has an inherent need to do good, be good, join good. Mimba believes that we all want to ‘donate’ our excess time and capacity for the benefit of others, if only given a way how. That’s why we have designed Mimba – the new underground to advance women’s health and rights globally by people like you and me who contribute our time, skills and networks to fight the good fight. Stay tuned for the second phase, when we will launch a first prototype and open beta-testing for you and your fellow activists!